Batteries allow you to store energy and use it when grid connections fail, like after storms or when there is line trouble or blackouts. Because large electric loads like air conditioning and electric water heating would require a massive battery bank and lots of solar panels, what is more common is carving out necessary appliances and lighting to run on battery power into what’s called a critical load subpanel. All of the electric circuits on this panel are backed up by battery power and solar panels. Batteries — and we’re not talking about a few AA cells. Think hundreds or thousands of pounds. Critical Load Subpanel — to separate the electric circuits that will be backed up. Battery Backup Inverter/Charger — converts power from the batteries during grid failures and recharges batteries from solar and grid power. It also acts as a transfer switch, switching seamlessly between grid, [optional] generator, and battery power as needed. 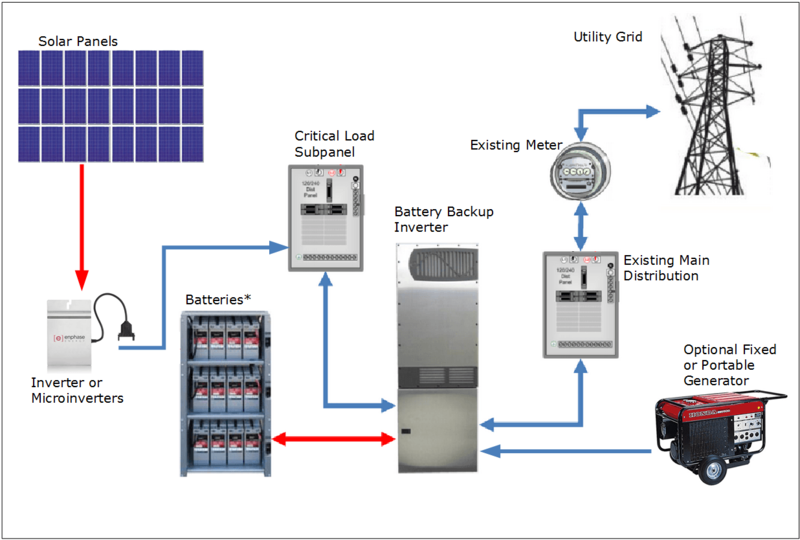 There are more traditional battery backup systems that omit the grid-interactive inverters connected to the solar panels and the battery backup inverter serves this purpose. In this case, solar panels connect directly to the batteries through charge controllers. While this is the most efficient way to charge batteries, it is not the most efficient way to provide power to your home when utility power is available. Since most homes have 99%+ utility up-time, it makes more sense to optimize the system for grid availability. In the end, the vast majority of solar electricity shoppers opt to install a grid-interactive system without battery backup. The cost of the additional components for a battery backup is usually prohibitive, and homeowners conclude that relying upon a traditionally fueled temporary generator is the best option for their backup needs. We do design, sell, and install battery backup systems, so if you are still considering this technology as part of your solar energy purpose, contact us! * Note: There is an inverter system from SMA that allows you to have a small amount of temporary emergency power when there is adequate sunlight without the need for batteries, but it is limited in what it can do, and beyond the scope of this article. One work around for the battery backup system is to connect the solar panels to a hydrogen generator which breaks apart molecules into separate hydrogen and oxygen atoms. The hydrogen is compressed and stored as liquid hydrogen, and the oxygen is a byproduct which can be funneled into the atmosphere or air system to improve quality. Liquid hydrogen is must more stable than gasoline and combusts only at greater temperatures. It can be used as an independent fuel source thereby negating entirely the need for either battery backup or grid interactivity. Thoughts?